The IVR engine now converts text to speech using the Say object. 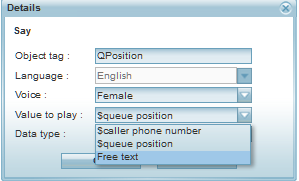 The Say object relays static free text or dynamic value of a variable (phone number, queue position) to the caller. These text to speech announcements can play dynamic or static data in multiple languages. For a list of language supported, click here.